It's about 8:30 on a cold Saturday morning. If the weather forecasters are right, in a few hours the biting wind will turn to rain. Yet a small army of nearly two dozen volunteers is preparing for a day of hard manual labor, constructing a new family-friendly trail to the popular Rattlesnake Ledge near North Bend. 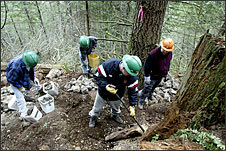 Josh Misenar of Kirkland selects rocks to use for building the new Rattlesnake Ledge Trail. "It's kind of a screwy thing," said Kevin Hunt, one of the assistant crew leaders for the Washington Trails Association. "On a sunny day, you may have 20 people signed up to work and only five show up. Maybe they're out hiking." 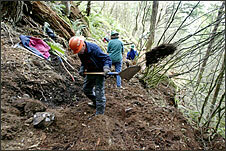 In a way, it's actually because of the weather that the volunteers are working on the Rattlesnake Ledge Trail. The Washington Trails Association has worked for years on backcountry trails. Problem is, those areas generally are accessible only during the summer and fall months. "We used to go dormant over the winter," said Greg Ball, the group's director of operations. "But then a number of our hard-core volunteers started complaining, 'We don't have to stop working now just because it's snowing.' That's when we started looking into the Issaquah Alps." The wintertime Thursday work parties grew so popular that the group added more days. Now they're up to a five-day workweek, including weekends. Even snow doesn't get in the way. "It's incredible," Ball said. "I've worked out there in 6 inches of snow before. You could hardly find the trail, but the people were still working out there. They're just crazy." 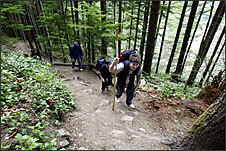 The Rattlesnake Ledge Trail certainly could use the help. The current trail was designed in the 1970s, long before many people knew about the spectacular views of Mount Si and Chester Morse Lake from the ledge at nearly 2,100 feet. These days the trail is packed on weekends. Even the Yale University Glee Club used it for a field trip the day after a recent performance in Seattle. Scouts Landon Gibson, front, and Will Huiras, of Troop 401 from Auburn, hike the existing 1.3-mile trail with Neal and Aaron Prenojost. The new and improved trail is expected to be completed in June. "It wasn't designed to take the kind of use it's getting," Ball said. Because the trail wasn't designed for such heavy traffic, it's short on amenities. The trail is riddled with obstacles. Hikers have to climb around boulders in the middle of the trail. Thick roots protrude into the trail in other places. And then there are the switchbacks. "So many people cut the switchbacks, they've removed all the vegetation," said Chris Bell of Seattle. "So many people are cutting the corners, all the green stuff is gone." The new trail, which should open in early June, will have just one switchback and it will not be anywhere near as steep. The current trail, which averages a 20 percent grade, knocks the wind out of less-conditioned hikers. The new trail will be about half that steep on average. The trade-off is that the new trail is longer, adding about three-quarters of a mile each way to the current 2.6-mile round-trip hike. "It will be a great family trail," Bell said. "We wanted to keep the grade moderate so it wouldn't prevent people from using it." But the work is very difficult. While volunteers from the Washington Trails Association started at Rattlesnake Lake and are working their way up, teams from Earth Corps and the Mountains to Sound Greenway Trust are starting at the ledge and working their way down. In their way are many of the same obstacles that plague hikers. The dirt flies as assistant trail crew leader Pete Dewey, along with Pamela Buck and other Washington Trails Association volunteers, carve out a new section of the Rattlesnake Ledge Trail east of North Bend. "Boy, this is a tough little guy," cried Hunt, as he took an ax to a large stump that was directly in the path of the new trail. "This is my way of not having to go to the gym," said Johnny Wells of Leeds, England, who took turns with the ax. Stumps are a common problem, and in some cases it takes the volunteer crews three days to clear one. Boulders present their own problems. The volunteers have to move them by hand; they're not allowed to blast them out of the way. Other times, they have to construct rock walls and dig out organic material and replace it with dirt that's more stable. If they didn't, the trail would turn to mush the first time it rained. All told, it takes the volunteers about two hours to build 1 foot of this trail. "That's really high for us," Ball said. "Usually we can build a trail faster than that." While the job is tough, the work parties attract a wide range of volunteers. Monica Collier, a junior at Highline High School in Burien, joined a work party last year to earn community service credit for a science class. She and her friend, Shasta Krueger, came back this year to meet the community service requirement for their English class. 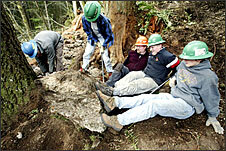 Washington Trails Association volunteers, from right, Brad Zeiger, Johnny Wells, Kevin Hunt, Aaron Gaskill and Gary Larson, put their backs -- and backsides -- into moving a boulder. Aside from fewer obstacles, the new Rattlesnake Ledge Trail will ascend more gently, but will be longer, too. "We just wanted to do something outdoors," Collier said. "And we didn't want to do something that would just take us 30 minutes." As Collier dug out organic material from one section of the trail, Krueger worked nearby, helping other volunteers shove aside a decaying log. "We were really looking for something different to do," Krueger said. "We didn't want to just pick up garbage in the city." Other volunteers signed up as a way of giving back to the hiking community. "I've been a hiker for years and this is my way of putting something back into the system," said Pete Dewey, who was working as an assistant crew leader. "Besides, the government has really decimated trail funds. If we didn't do it, there wouldn't be much in the way of trail maintenance." There's a special incentive for volunteers who regularly join work parties. "If they come out five or more times, they get their own hard hat with their name on it," said crew leader Gary Larson. "It's an incentive that works pretty well." As Aaron Gaskill, left, and Brad Zeiger, rear, collect rocks for use in trail construction, Johnny Wells uses a pry bar to remove a root while Kevin Hunt supervises. They are all volunteers from the Washington Trails Association. For those who already have earned their hard hats, the incentive evolves into seeing other people use improved sections of trail on which they worked so hard. "Those are my steps," said Bell, climbing up a lower portion of the new trail. "It's kind of fun to go over it and say, 'That's my work' or 'That's Jim's work.' We all take credit for our various parts of it." Not everyone is ecstatic with that work, however. "Some people express dismay that the new trail will be too easy," Bell said. "That's always a problem. Those conflicts come up all the time." But the man who designed the trail says those concerns are largely unfounded. While the new trail will be less steep, on average, there will still be a handful of steep portions. There also will be less risk of injury to people who get their exercise by running the trail -- up and down. "People will still be able to get a nice aerobic workout, even though they will find the new trail to be somewhat easier than the old trail," said Mike Stenger, trail projects coordinator. "There will be less chance of twisting an ankle, thanks to fewer obstacles." The easier trail may finally give Chris Blazevich an opportunity to take his sons to the ledge. He lives nearby, and hoped his boys, ages 4, 6 and 9, would enjoy the view. Less than a half-mile from the ledge on the old trail, however, the boys complained they were tired and asked to go home. "You'd probably get more families up here," he said of the new trail. "From what I've seen, it's mostly single people going up now." Getting there: To hike up to Rattlesnake Ledge, take Exit 32 from eastbound Interstate 90. Turn right on 436th Avenue. Watch for a large, paved parking area on your right in about four miles. No fees or permits are needed to park there. To reach the trailhead, walk on the gravel path that bends around the north side of Rattlesnake Lake. A sign marking the start of the trail is about a quarter-mile from the parking lot. Trail detail: The trail is steep, gaining about 1,200 feet over its 1.3 miles. Allow about 45 minutes to an hour to reach the ledge. 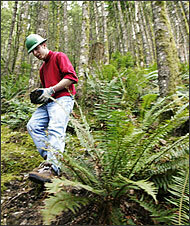 Volunteering: To volunteer to work on the lower portion of the new Rattlesnake Ledge Trail, sign up through the Washington Trails Association (206-625-1367) Web site, www.wta.org To work on the upper portion, sign up through the Mountains to Sound Greenway Trust (206-812-0122) Web site, www.mtsgreenway.org Another group active in trail repair is Volunteers for Outdoor Washington, www.trail-stewards.org, 206-517-4469.